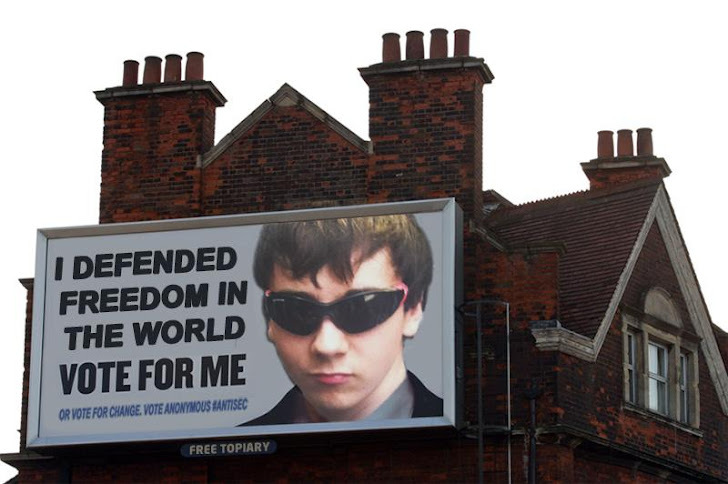 Two Days before Accused LulzSec hacker "Topiary" was got arrested and today he released on bail. Jake Davis, an 18-year-old from the Shetland Islands, was released on bail after being charged with five offences relating to computer attacks and break-ins by the LulzSec and Anonymous hacking groups. 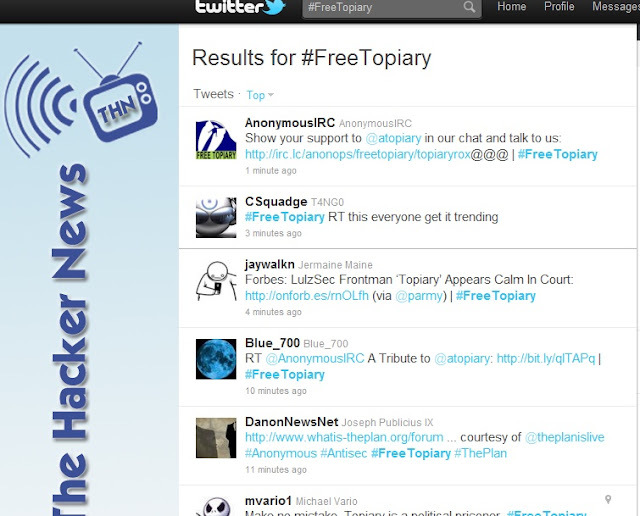 In his support today all Anonymous and Lulzsec hackers stand together once again with a new operation #FreeTopiary on Twitter. Anonymous Call everyone for Show their support to @atopiary on IRC Chat. Anonymous also call for Anonymous Legal Help also. 1.) FreeTopiary an idea is the seed of human kind. 2.) Make no mistake, Topiary is a political prisoner. 4.) You cannot arrest an idea. On an historical day of the days of the great Anonymous... the Simple Prankster Turned Swank Garden Hedge - Topiary (may theLulz bless his soul) has been vanned in a moment of truthfulness, for he made his word truthful to his actions. Thus, he joined the magnificent procession of the Anons that has been extended with the great leaders, loyal soldiers, and honourable knights. He refused to accept vice in exchange for his lulz, or to submit and be humiliated by the misguided and the receivers of the wrath of Sec, who have been stricken by disgrace and misery. Topiary faced the lulz with lulz, force with force, and accepted to challenge the supercilious throngs that came out arrogantly and ostentatiously with their machinery, gear, d0x, and lack of humor. After a life full of efforts and diligence, courage and patience, incitement and cyber victory, generosity and charity, expatriation and travels, advice and good planning, wisdom and sophistication, the life of the Garden Hedge came to an end during this specific era. His blood, words, attitudes, and his ending are to remain a longcat running within the junctions of Anonymous generation after generation. If Scotland Yard succeeded in vanning Topiary, that is no shame or disgrace. Are not men and heroes killed but on the battlefields? But can the British, with their media, agents, tools, soldiers, and apparatus kill what Topiary lived and was vanned for? Alas! Topiary did not found an organisation that lives with his life and dies with his death. We raised his rank as he held high our lulz. We cherished him as he cherished the lulz; and through him, we frightened the totality of the unlulzy parties as Topiary feared only the shears. If the light of Anonymous and AntiSec could be extinguished with the vanning or death of someone, it would have been already. Alas, it is not so. We in Anonymous vow to David Davidson the Exalted and seek His support to help us go forward on the path of AntiSec that was trekked by Topiary. We stress that Topiary's blood, bless his soul, is more precious to us and to every Anon to go in vain. It will, lulz willing, remain a curse that will chase and haunt Sec and its agents. The anons of Anonymous, whether in groups or individually, will not relent, despair, surrender, or weaken and will continue to plan until you are afflicted with a catastrophe that turns your very life into lulz. We call on our Anons in the UK where Garden Hedge Topiary was vanned to revolt and wash this shame brought upon them by a band of traitors and bandits who sold out to Anonymous' enemies and disparaged the sentiment of this noble, lulzy people. We call on Anons to revolt altogether to cleanse the world of the ProSec filth who spread mischief in the land. The Hedge refused to depart this life before sharing with Anonymous its happiness with the revolutions against injustice and wrongdoers. He, bless his soul, tweeted a message one week before he died, which included guidance that will soon, lulz willing, be disseminated. Topiary – may you fly always over the horizon.